Designed your own rack card?? As long as the file is compatable, the price below is the price you will pay, no setups, design or other charges! We usually provide 2-3 day service on digital rack cards. 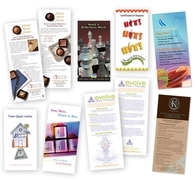 Our standard digital card stock is a 12pt coated card stock, but other stocks available. We can even provide competitive pricing on 100,000 or more! These extremely high quality post cards take approximately 2 weeks to produce.